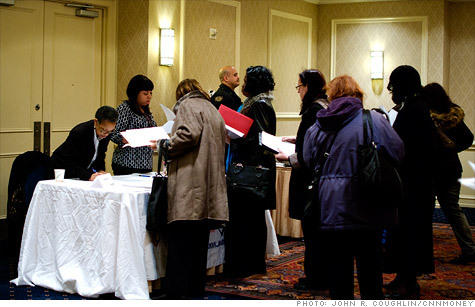 NEW YORK (CNNMoney) -- First-time claims for unemployment benefits dropped last week, matching the four-year low hit in February. The Labor Department reported Thursday that 351,000 people filed for initial unemployment benefits in the week ended March 10, down from the previous week's revised 365,000 claims. Economists surveyed by Briefing.com had predicted 355,000 new claims would be filed. About 3.34 million people filed for their second week of unemployment benefits or more in the week ended March 3, the most recent data available. That's down 81,000 from the previous week. Jobless claims are considered a key indicator of the job market's strength. The number can be volatile from week to week, so economists often look to the four-week moving average as a broader gauge. Lately, that figure has been on a gradual decline. But last week it was unchanged at 355,750. The report comes amid a bevy of encouraging signs for the job market. Last week, the government reported that hiring remained strong in February, with employers adding 227,000 jobs. While that's a pinch slower than in January, hiring was still better than economists had expected. But three straight months of job growth over 200,000 is considered a strong sign for the recovery going forward. Economists called the report "encouraging," "robust," and even claimed the job market "has turned a corner."